NanoPhotonica’s innovations in nano-material chemistry, as well as processing and layering techniques for Quantum Dot Light Emitting Diodes (QLEDs), set us apart from all other related display technologies. Our QLED display technology provides purer and brighter colors with efficiencies that exceed technologies in the market today. As important, our QLED based displays can be manufactured with low cost and high throughput production lines that minimize material waste. These advantages provide large price reductions to the consumer as well as a substantial profit margin to the display manufacturer. NanoPhotonica is the recognized world leader for QLED display applications, as witnessed by our growing list of display partners, our numerous distinguished publications, and the various regional and national awards we have received. Quantum Dots (QDs) have recently become one of the hottest new trends in the tech industry for a variety of applications. Additionally, NanoPhotonica’s thin, flexible and transparent nano-material systems will continue to lead the way for next generation displays, lighting, and beyond. Our growing lists of patents and applications help demonstrate and protect our reputation and status. Quantum dots (QDs) are tiny crystals that have special properties due to their size and chemical makeup. These properties make them especially useful materials in the electronics, medical and other industries. In the display and lighting industries, these properties are harnessed to generate vivid colors with low power consumption for mobile phones, televisions, and general lighting so the consumer benefits from longer battery life, beautiful pictures and video, and a lower electricity bill. 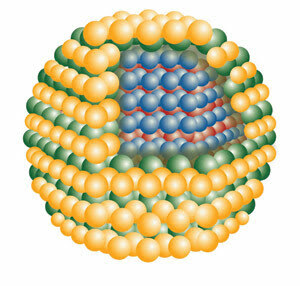 Image: The structure of a quantum dot showing its three main features: core, shell and ligands. 15 nm (or nanometers) is roughly 1/10,000th the width of a human hair. The three important features of quantum dots used in the display industry, called core-shell quantum dots, are the a) core, b) shell, and c) ligands. a) The core is composed of the material that will be emitting the pure, bright colors. The core’s size and chemical makeup are tuned on an atom-by-atom basis to give off the exact color light needed. Quantum dots can emit any wavelength of light, from ultraviolet to the infrared, and every color in between. b) The shell is a coating made of a different material that protects the sensitive core from moisture and oxygen, as well as encapsulates the core material from the outside world. It also plays an important role in fine tuning the color that will be emitted from the core material and other electronic properties. c) The ligands, usually long chain molecules ensure that the quantum dot can be printed in a liquid during manufacturing, as well as play an important role in the electronic properties. When these three features of quantum dots are tuned to how we need them, we develop exciting new applications. One of those applications, and the focus of NanoPhotonica, is developing these materials for Quantum dot light emitting diodes, or QLEDs. Light emitting diodes – LEDs for short – are increasingly popular in lighting and displays. Now, almost all LCD TVs, computer monitors and mobile phones, are backlit with LEDs, making them known as LED TVs, LED-LCD TVs, or just LCD screens. They are also at the front of the push for more energy efficient light bulbs to replace incandescent and even fluorescent bulbs for general lighting applications. In a typical LED, several materials are layered together in a structure called a device stack. These materials are carefully selected to emit the desired color light with high brightness and efficiency. The overall thickness of this whole device stack is approximately 10 micrometers thick, or about the width of a human hair. These LEDs, like the type that earned Nakamura, Amano, and Akasaki the Nobel Prize in Physics for 2014, are the template from which QLEDs are born. QLEDs are these LEDs, but with quantum dots made to be the material which emits light, rather than some other material. In a typical QLED device stack, the quantum dots are surrounded by other materials responsible for injecting charges into the quantum lot layer. When the injected charges find each other on a quantum dot, they “recombine”, or destroy each other to emit light. This process is called electroluminescence (EL). This is the same physical mechanism by which another upcoming technology, OLEDs, work. But in contrast to OLEDs, by taking advantage of an interesting effect from quantum mechanics called the quantum confinement effect, we can tune the color of emitted light simply by changing chemical make-up and size of the quantum dot. Additionally, the colors emitted by our quantum dots are objectively more pure than those emitted by OLEDs. The image below shows a typical QLED device stack, which is only ~200 nanometers thick, or 1/1,000th the width of a human hair. Image: The device stack structure of a typical QLED (quantum dot LED) which is roughly 200 nm thick, or 1/1000th the width of a human hair. What are the Advantages of QLEDs? Current quantum dot display and lighting technology from our competitors merely uses quantum dots as backlight color converters in decades-old LCD technology. This adds another layer of complexity to an already outdated product. These bulky products still suffer from high cost of manufacturing, low contrast ratio, slow pixel switching, narrow viewing angles and high power consumption. These quality and cost problems are significant for the customer. Our NanoPhotonica QLED display technology overcomes these problems and delivers the highest quality products to the customer. Unlike our competitors, we employ quantum dots and other unique nanomaterials as standalone, electrically-driven LEDs to deliver purer colors at lower operating power without complex color filtering and polarizing structures. Using quantum dots in this way also allows us to take advantage of inexpensive high-throughput mass production techniques like printing to reduce cost to the customer and increase profit margins to manufacturers. Additionally, our QLED technology enables ultra-thin and lightweight displays with a high contrast ratio, wide viewing angles, and fast on/off switching, giving the customer the best color quality, motion rendering, and longer device battery life. © 2010-2018 NanoPhotonica. Design by Smarter Website Designs.